Imron is a Subud member, originally from California, who has lived for many years in Adelaide, Australia, then had a stint of ten years or so in Kalimantan and Timor, and is now back in Australia again. I am a Muslim, not particularly inclined to ‘new age’ approaches, but simply struck with the undeniable force of what I experienced. At the time of the message, 1999, I had no awareness of the concept of ‘2012’ and I have long remained unsure of sharing this experience. However, it is now clear that the message correctly predicted changes in scientific thinking; changes that are now quite apparent even to the curious layman willing to spend a few hours researching this subject. I discovered that a growing number of reputable scientists are rushing toward a new paradigm; a new view of reality which takes a seat uncomfortably close to ‘fringe science’ and ‘new age’ beliefs. This emerging change in the sciences satisfied my own need for some kind of ‘proof’; something that might suggest there is credence in the balance of the message. This message insists that a remarkably beautiful change is on the way and that we should consider the significance for ourselves of ‘generosity’ in approaching these ‘soon to come’ changes. The conversation I have recorded is the greater part of what was said but is not always an exact recall of the words. It remains a record of the meaning conveyed. Things were mentioned that have been grayed out over time. Among these were geophysical disasters accompanying or around the period of change. But because my memory of this is so weak I cannot in good faith do anything but note my feeling that this was spoken of, but I am not able to give it context or detail. Further than this would only be speculation. Certainly there were no prescriptions for physical or economic survival beyond the simple and repeated emphasis on ‘Generosity’. That “something will happen in 2012” is arguably the most widespread rumor in human history; a foundation stone upon which have been built many a shadowy tower and the focus of many a prophetic claim. I use the year here not so much as a date as an allusion to some ‘soon to arrive time of transformation’. Thousands of people are expressing their views on this subject on the internet, in books, and through seminars. I am but a single voice promoting the oddities of a brief encounter. I would wish only that the reader might reflect upon what I was told that day and apply this into the mix of their considerations. 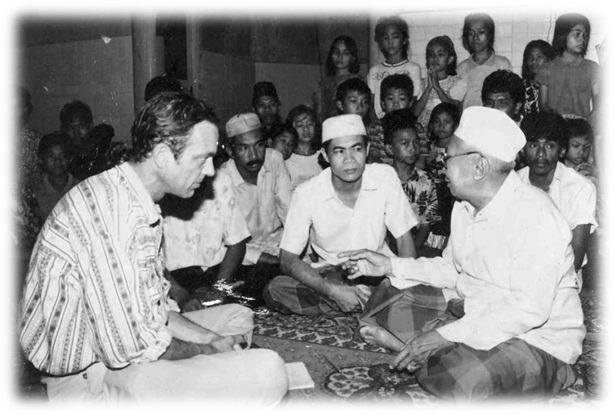 In late 1999 I was working as a ‘poverty alleviation’ consultant in the Indonesian part of the island of Borneo, some forty kilometers from Palangkaraya, the capital of the Province of Central Kalimantan. It was my habit to make a weekly check on participants in our programs in several of the transmigration sites located there. I had finished with my meetings and it was early afternoon. I was only about an hour’s drive from the office in town and figured I could afford a few minutes to check the roof of a wooden farmhouse I had recently bought in the area. I was concerned the roof might be leaking; something that can lead to quick deterioration in the tropics. The farmhouse was on a block of land located only a few minutes off the main road. As I turned off into the rocky little track that led back into the farming area I was already feeling strange. It was as if I had been hyperventilating, yet was not. A tingling sensation was running through my limbs, becoming increasingly intense; a pleasant kind of “pins and needles” that began to totally engorge my musculature. This fizzing rush of energy filled my cells and ran deep into my bones. A sensation of extreme well-being which I can only begin to capture with the word ‘bliss’ began to invade me. It was as if I was being drenched in a liquid form of love, utterly comforting, carrying me to a feeling of willing abandon. As I drove up the road toward the cottage, I found that under the extremely relaxing influence of this ‘bliss’, and the incumbent vibration that now sizzled in my flesh, my muscles were becoming awkward and seemingly detached. My movements no longer entirely followed my intent. I stopped about a hundred meters from the cottage and stumbled out of the car, my body now behaving as if I were drunk, and lurched awkwardly toward the little house. The idea of checking roof leaks had vanished from my thoughts. I only wished to be somewhere I could allow this marvelous sensation to continue. Behind the house was an old neem tree. I fell to the ground beneath it, overcome now by the luxury of this feeling and a rather wild desire, noticeably sexual in character, to be consumed by the earth. I lay under the tree. In this way, relaxed upon the earth, I immediately saw a massive vortex, twisting up into the sky and seeming to descend into the earth only meters from where I lay. Riding this circling cone, and seeming to be carried up and down on its twisting spirals, were grayish forms which I took to be some kind of entities. One of these stopped next to me, hovering on my right side. I was still completely aware of my environment: the feel of the earth under me, the breeze, and the sun streaking through the leaves of the tree. I believe this an important aspect of the experience; that I still had normal awareness of my environment, the experience then becoming a powerful penetration of a more numinous reality into my everyday world. The vibrating fizz of energy continued to course through my body. It was then that the ‘entity’ spoke. This was an amazing set of seemingly related words. ‘Generosity’ was repeated. My questions were not thought out. I was in fact hardly thinking at all although very ‘aware’. Perhaps this assisted my later ability to remember events and the answers so well. The voice answered my questions as if they were expected. Those were his exact words. I say ‘his’ because it was a male voice. “What kind of change?” I asked. “Mankind has always lived from self-interest. It is part of his current nature. It is part of the program within. In a time shortly to come this will be changed. People will begin to regard others as equal to themselves, even to think of others as if part of themselves. No new growth can occur until this change is fully manifest. “This change is being made in the DNA of mankind; in your genes. Nothing new is being added, but there will simply be an alteration. Certain genes will be activated that are already present; turning them on. “God has given you the internet as a metaphor. It is an analogy for the conditions that are coming, for the way in which human beings will move towards oneness. In this communication with the entity I believe there were no misunderstandings because his words were transferred on the back of ‘meaning’ and not the other way around. This is the very special property of that ‘internet’ of which he spoke. ‘Seeing’ this internet in my mind at the time, it was for me a subtle web of holographic reflections seeming to be bound into every cell of the body, glimmering in response to those to whom we were communicating, like sparkling neurons in some harmonic play with one another; each a mirror to and already somehow a part of the others. He continued, “The internet I speak of is something that already is in place. It is within your DNA. As he spoke I saw two people facing one-another each with some capacity to serve the other, and the desire to do so, without seeking reward. In the energies of this new world I could see a thousand resolutions and an almost automatic rush to improvements in the conditions of every life. Every lack being filled, the resources of the earth would be turned to honest purpose, leaving some things to wither while others would blossom. It is not hard to imagine what would be the wheat and what the chaff. The old biblical ‘swords to plowshares’ comes to mind. “These will pass and change form. God has already prepared everything for you. If you could understand it, within ‘generosity’ is already the key to God’s own financial system: God’s money. “Prepared within everyone since time began are the gifts necessary for their role on the earth. These gifts are meant to be given; employed and developed to bring richness and quality to the life of the earth and its creatures. Yet, in greater part these gifts have lain within you undiscovered, and many poorly, or wrongly used. “To understand this you might look at the example of the rainforest. This island, Borneo, is known for its great forests. These forests have taken countless years to develop. They are home to innumerable species of animals and plants. You need to understand something about this. Each of these organisms has been created, but not in the way that scientists currently believe. They will come to understand this differently. I was feeling that there was a particular significance in the constant reference to ‘generosity’; a significance that was tied to the ‘gene’ in that word, and to the mysterious (for me) science of genetics. “Within the rainforests it is apparent that every creature, every living thing, is in some way dependent on others for its growth, its life, and further, that every living thing offers something back into the system of the forest that provides for or improves the life of others. The entirety is a living network of interdependence that spans and reaches out in myriad connections; connections running deep into to the earth itself and these reaching further: to the sun, stars and beyond. “This is something that can be studied and can be understood. What has not been considered, but which will soon begin to be understood, is that the movement toward the tremendous complexity and beauty that is found in the forest – just one tiny part of the creation – is the result of the ever refining movement of the force of generosity. “Consider that the very nature of a new species is a product of the needs of that which already exists and answering a powerful creative intent. Generosity is the mechanism of this intent. It acts with an energy you call ‘love’; the creative and sustaining force of The One, which you know as the beneficent, the compassionate, and the merciful. “New things, in essence, come into being upon the word of intent of the creator, with the energy of love, and the desire to fulfill the needs of that which already exists, perpetually refining and increasing. “Your understandings of evolution will soon change. Your own sciences will begin to indicate the truth of this generative force and its presence and role in the creation of every creature and in the creation of stars and planets. “In the forest everything exchanges. Each gives to and takes from others. This is the true and perfect economy; and also the economy of the universe. Mankind should be part of this economy, should be contributing to it, refreshing, refining and renewing it. But currently mankind’s economy is built around his vanity and lust for personal power and wealth. “With these changes that are coming human beings will be transformed, awakened to their true purpose. They will begin to be bent to the real service of others and to the creation; to adoration of the source, the One; that of which we are all a part. That is their role. When conditions are like this it is then possible that the Kingdom of God will come upon the earth. Against his lovely picture of a miraculous universe tied into our deepest being, I was seeing the darker world we have created in a kind of crippled mimicry; that of the complex steel and oil fed industrial world in which we lived. Within that vision my thoughts came to rest on my own dependence on air travel, if not my romantic love of aircraft. I would now wish to have been able to ask so much more, so many questions that would arise after I left that place. But the condition was fading and this relatively pointless, if not immature, question about airplanes was to be my last. I felt a diminution of the tingling and the bliss. I was clearly returning to my everyday state and I lost at this point the awareness of that voice, and the vision of the vortex. I stirred to my feet and my attention moved completely back to this world. Although I recalled then that I had come to check for leaks, I had so completely lost interest in the condition of my house that I started immediately to walk back to the car, hoping to retain the feeling for as long as possible. I was still bathed in the residual comfort of that marvelous blanket of bliss that had enfolded me during the experience and from knowing that I had be given a startling revelation. As I drove toward Palangkaraya, I realized that the experience was not entirely over. Whatever the condition was that had resided in me, allowing me to communicate with that entity, now continued in a different form. The ‘love’ that had enveloped me at the outset of the experience had now subsided to a soft feeling of utter safety, but it now sustained me, the feeling itself containing something that brought with it a marvelous statement about the nature of this life. In those moments I needed nothing else. I was wrapped in a comfort for which the word ‘happiness’ fails completely. I was beyond happy. Rather I was ‘at home’, seemingly embraced by the warm attentions of my creator. What greater security can we hope for? Somewhere in each of us there is a sense of this ‘at home’ feeling. Its most immediate image for the western mind is found in the warmth of the hearth, our child self, nestled in the arms of mother at the end of a busy day, the cold dark night locked out, the murmur of a sleepy story, the crackle of the fire. This brought me to a new awareness of my own condition in this life. The phrase “the truth shall set you free” seemed to capture it perfectly. ‘The Truth shall set you free’. As I said this to myself in my reverie I was doing so in reaction to a new understanding about the condition of mankind that was invading me with force in those moments. The ‘truth’ mentioned in this phrase was not something external, discoverable, or some finally reduced scientific or even spiritual clarity. It was nothing more or less that the simple state of my own being at any moment when I have no longer the fear of death. And it was this feeling of blissful and penetrating love that worked this magic on me, that freed me, at least for those moments, from that fear. Truth is about me. About ourselves. It is about what and who we really are; our lost connections with all that is about us suddenly plugged in, suddenly making us part of a greater life that has always been moving unseen within and around, exposing us to the lies and self-deceit we live, exposing us to the fears that move us; exposing us too, to the love and delight, the sustaining breath, that has always been as close as our own heart. If we are at that moment to be flooded with the truth of our condition and if we are open and accepting, I saw this would be a journey out of our prison of lies about ourselves; an awakening into a new world of a freedom we cannot begin to imagine. I felt that this would happen. was as if I was being drenched in a liquid form of love, utterly comforting, carrying me to a feeling of willing abandon. . . . Behind the house was an old neem tree. I fell to the ground beneath it, overcome now by the luxury of this feeling . . .
One of these stopped next to me, hovering on my right side. I was still completely aware of my environment . . . The vibrating fizz of energy continued to course through my body. Imron had first visited Kalimantan in 1991, detouring from a projected tourist visit to Bali in order to help out a friend by delivering a large bag of much-needed prescription medicines destined for the indigenous Dayak people. Little did he know that this chance diversion would dramatically change his life, now culminating in this inspiring and gripping account of spiritual experience and sheer adventure worthy of a tale by Kipling. Along the way, the author treats us to an erudite and eminently readable overview of the blurring demarcation between the realm of spirituality and that of the newest science, concluding, My claim, from the message, is that the ‘Truth’ will soon be revealed to each and all of us on a scale and in a way we cannot imagine. In my humble opinion, the power and beauty of this book’s message cannot be overstated. I believe it is intended for the whole world. The hard copy is available from Amazon.com for USD10, while the e-book can be downloaded from Lulu.com for just GBP2.93. The e-book will also soon be available to Kindle users at the same price. Here I know more was said, but I cannot honestly recall the detail of the message. I can only mention my recollection that something of ‘disturbances’ and an apparent parting of ways between those who could contain the changes and those who could not would occur but am not confident enough to place it along with that which I clearly recall and about which I made some notes not long after the event.